The Chicago Bears on Sunday night against the Indianapolis Colts looked like the Bears of old, but with some differences; the combination of an opportunistic defense and a potent running attack that controlled the clock sealed the deal as Chicago handily defeated Indianapolis 29-13 at Lucas Oil Stadium. The Colts had issues with timing – highly unusual for a team that is the master of offensive timing – which could be attributed to perhaps quarterback Peyton Manning getting his game together slowly as he is coming back from knee surgery and is getting the game rust shaken off. What also hurt the Colts was the loss of tight end Dallas Clark to a knee injury in the first half and running back Joseph Addai with a head injury in the fourth quarter. In addition, the Colts allowed the Bears to convert 10-of-16 (62.5%) third-down chances, which kept the defense on the field for entirely too long. But first and foremost, the Bears defense played a big part in the Bears win; a safety by Chicago when Addai was tackled in the end zone, along with wide receiver Marvin Harrison fumbling a reception while Bears linebacker Lance Briggs scooped up the ball and returning it for a touchdown. 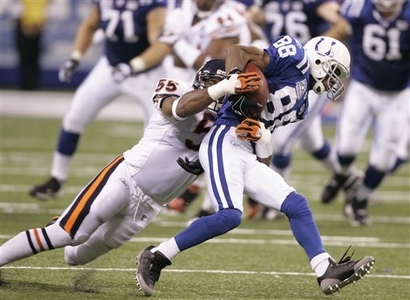 The Bears also allowed the Colts only 53 rushing yards. While the Bears passing attack was, for a better choice of words, efficient, it didn’t impress anyone; but then again, it was not really needed on Sunday night. Kyle Orton went 13-of-21 for 150 yards while Manning was un-Manning-like, going 30-49 for 257 yards with a TD. Matt Forte led a potent Bears rushing attack with 123 yards on 23 carries and a rushing TD while catching 3 passes for 18 yards; Kevin Jones added 45 yards on 13 rushing attempts. Addai led the Colts rushers with only 44 yards on 12 carries. The Bears receivers were led by a pair of tight ends as Desmond Clark led all Bears receivers with 2 receptions for 46 yards while Greg Olson grabbed 2 balls for 36 yards. Reggie Wayne led all Colts receivers with 10 catches for 86 yards and a TD while Harrison added 76 yards on 8 receptions; Anthony Gonzalez chipped in with 5 catches for 48 yards. Chicago (1-0) looks to run their winning streak to 2 as they travel to Charlotte to face the Carolina Panthers on September 14 while Indianapolis (0-1) continue the NFC North journey as they fly north to Minneapolis to take on the Minnesota Vikings – also on September 14. I’m so confused! I started getting into football a couple of years ago, but I don’t remember the Indianapolis Colts playing Chicago, Minnesota or Green Bay (and maybe others). Did something in the scheduling get changed?